D&RGW K-36 Mikado #482 in Durango station on the Durango & Silverton Narrow Gauge Railroad. In 1925, the Rio Grande was pursuing the modernization of its narrow gauge system and ordered another series of 10 Mikado from Baldwin Locomotive Works, again outside frame engines and equipped with superheating. They were numbered from 480 to 489 and designated class K-36. These engines were the last narrow gauge locomotives ordered new by the D&RGW, they were heavier and about 30% more powerful than the K-28. 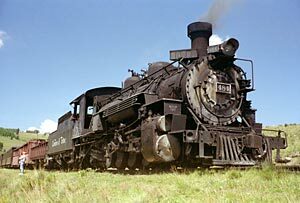 The K-36 were freight engines but were also occasionally used on passenger trains, especially on the San Juan between Alamosa and Durango in the fourties and fifties (#482, 483 and 489 were specifically modified for this purpose in 1936-37). At the beginning of their career, the K-36 were based in Salida and used as helper engines on Marshall Pass between Salida and Gunnison, as well as on the Monarch branch and toward Alamosa. Afterwards, some of them were transferred to Alamosa for use between Alamosa and Durango, as helper engines on Cumbres Pass and later on the Farmington branch when traffic boomed in the fifties due to the tremendous development of the oil industry in the area. The K-36 were considered as a very successful class of engines and were the workhorse of the Rio Grande narrow gauge fleet. They remained active until the abandonment of most of the D&RGW narrow gauge lines in 1968. Interestingly, the K-36 never ran on the Durango - Silverton branch during the Rio Grande era, they were too heavy for the light track and bridges of this branch line. K-36 #489 in Cumbres Pass with a freight special on the Cumbres & Toltec Scenic Railroad. Quite remarkably, nine of the ten K-36 survive today. 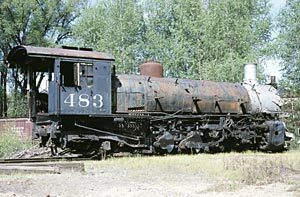 Number 485 was the only engine scrapped, after ending up its career prematurely by falling into the pit of the turntable at Salida in 1954. All the other K-36 have been preserved, on the Cumbres & Toltec Scenic Railroad and the Durango & Silverton Narrow Gauge Railroad. 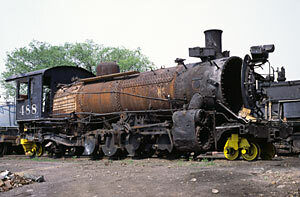 Number 480 was put out of service in 1964, was retired by the D&RGW in 1970 and remained stored in Alamosa. 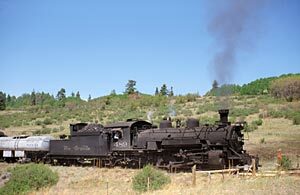 It was then sold to the Durango & Silverton Narrow Gauge Railroad in 1981 and was transferred to Durango where it was completely rebuilt and eventually put back in service in 1985. Number 481, overhauled by the Rio Grande in the early sixties but never used thereafter and stored in Durango since 1968, was also acquired by the Durango & Silverton Narrow Gauge Railroad in 1981, where it was refurbished and pressed back into service the same year. Number 482, retired by the D&RGW in 1962 and stored in Alamosa, was bought by the States of Colorado and New Mexico in 1970 and transferred to the Cumbres & Toltec Scenic Railroad where it would stay out of service. 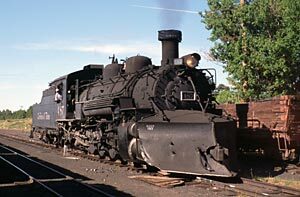 Then in 1991, it was exchanged with Durango & Silverton Narrow Gauge Railroad K-37 #497, was rebuilt in Durango and put back into service at the beginning of the next season. 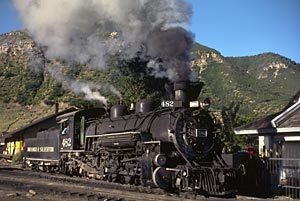 Numbers 483 and 484 were also bought by the States of Colorado and New Mexico in 1970 and were operational on the Cumbres & Toltec Scenic Railroad the year after. Number 483 is stored out of service in Chama since 1977, but #484 is regularly used on the tourist railroad and is again in service since 2004 after a derailment in 1999. 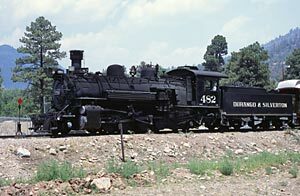 The Denver & Rio Grande Western retired #486 in 1962 and then donated the engine to the Royal Gorge Park near Canon City in 1967 for display. 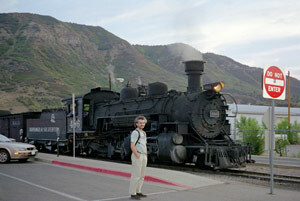 Later in 2001, it was exchanged with K-37 #499 and is now operational on the Durango & Silverton Narrow Gauge Railroad. Finally, the last three K-36, #487, 488 and 489 were also purchased by the States of Colorado and New Mexico in 1970 and transferred to the Cumbres & Toltec Scenic Railroad, where they were rebuilt and put back into service in 1973, 1979 and 1981 respectively. Since then, besides periods of inactivity because of overhauls or when awaiting repairs, all three of them are regularly in use on this tourist railroad. Apart from #485, all the K-36 have been preserved today. Number 480, 481, 482 and 486 are curently on the Durango & Silverton Narrow Gauge Railroad and number 483, 484, 487, 488 and 489 on the Cumbres & Toltec Scenic Railroad. All surviving K-36 are potentially operational and, except for #483 which have been out of service for many years, are regularly in operation on these two tourist railroads. K-36 #480 in Silverton, heading a Durango & Silverton Narrow Gauge Railroad train. 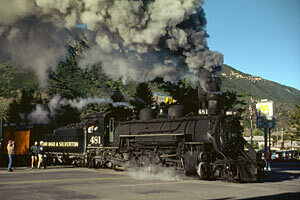 #481 in operation on the Durango & Silverton Narrow Gauge Railroad is switching at the Durango terminal. #482 in Hermosa on the Durango & Silverton Narrow Gauge Railroad. #483 out of service and without its tender in Chama. #484 in Osier on the Cumbres & Toltec Scenic Railroad. 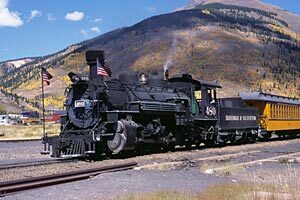 #487 in Chama on the Cumbres & Toltec Scenic Railroad. #488 being overhauled in Chama. 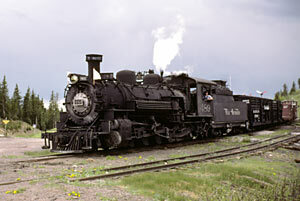 #489 in operation on the Cumbres & Toltec Scenic Railroad.